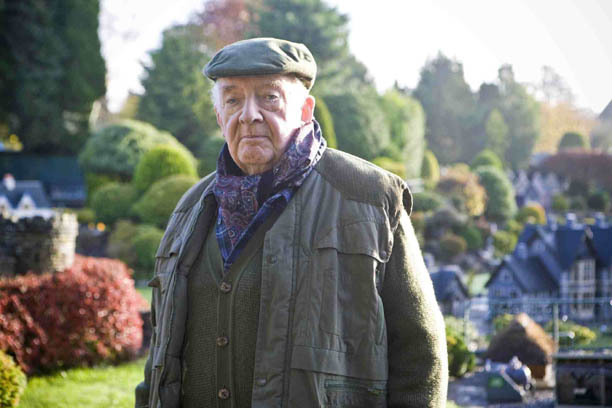 David Ryall enjoyed playing a caretaker whose peaceful existence is shattered in 'Small Mercies'. "Bob is a gentle character, a kind chap. He potters around in his cap and cardi like a gardener and he's never had huge ambitions in life. He's saturnine but happy with his lot as a country person. "He looks after the model village and it's become his life. He likes his little creatures there rather more than real people. So when he finds a dead body it's a terrible shock and rocks his whole world. "The murdered chap is tied down like Gulliver in the middle of the model village, like a horrendous kind of joke. Bob feels it is an outrageous thing to do and he takes it personally." Bob is employed by the Compton sisters to maintain the model village. Explains David: "His one venture into real life was an affair with a lady which didn't work out but he'll always carry a torch for her. Because of the English class system, it was doomed because they are not in the same class as people. I hope he has a happy ending." The role is David's first appearance in Midsomer Murders. "I'd never worked with John Nettles before but I admire him very much and he was charming, a complete gentleman. I think the series is unique and very English, and I love the country pastimes and slightly eccentric characters. It was also fascinating to go to the model village at Bekonscot." Caroline Blakiston is hoping for a hat-trick of appearances in MIDSOMER MURDERS. "This is my second time as I did an episode in 2005 so it was lovely to be asked back. I read the script and just thought 'goody'. I thought it was one of the best scripts I've done on television so I'd be happy to come back for the hat-trick. "I play Margaret Tyzack's sister and we worked together in the old Forsyte Saga of the 70s where I was an outspoken racy society girl and she was one of the aunts. So it was fun to be reunited. "One assumes that Hilary had a great sorrow in her life; she loves a guy in the story and this seeps out along with other revelations. Harriet, Margaret's character, is very controlling and disapproving as a sister and they don't really get on. Hilary has had quite a tough time - she runs things in Little Worthy and cares passionately about the model village - but she is a loyal and broken-hearted woman." The filming locations brought back many memories for Caroline. "We filmed at Great Missenden where I had been at boarding school after the war so it was lovely to go back. The last time I went, my old school was being used for Hammer House of Horrors and the dining room was dressed up for a black mass! It was a hoot. "In my previous time on the series, we filmed at Dorney Court near Windsor with jousting and all sorts of medieval behaviour going on. That was good fun, too, because I'd previously been burned alive there for Children of the New Forest." She adds: "We had some pretty cold days this time around and it was quite bitter out on a lake. We had hand-warmers in our boots to keep our feet warm and Reg from costume provided the best possible fur hat so that kept me warm. It's very rare to be well looked after, so what you get on Midsomer is very special." Septuagenarian Caroline shows little sign of slowing down. "If something thrills me, if I think it's really well written or if I meet a director I really like, then I want to do the work. Hilary was quite a big part, and I liked the character. She's a bit of a mystery and it's intriguing to find out why there is a sadness there." Adds Caroline: "John leads the company tremendously, he's has a huge classical career and he's the pillar of the programme, yet he joins in with all the young actors - I can't understand why he hasn't been knighted!" Abigail Thaw was thrilled to be asked to join the esteemed roll call of guest stars in Midsomer Murders. "We watch the programme in our house and it's something I've always wanted to be in. The scripts are great, the stories are wonderful and everyone looks like they are having a great time - and indeed we did. "I hadn't worked with John Nettles before, but we had a lot of connections. I knew his first wife Joyce and my step-sister had worked with John many years ago and I knew of him through other people as he's extremely popular and has such a wonderful reputation amongst actors." Abigail plays Annabel Johnson, who runs a gift shop in the tourist trap of Little Worthy. "Annabel is very frustrated and rather bored, sad with her loss. She has found herself in an unhappy marriage to her husband Mike, played by Jesse Birdsall, after a childhood romance that went too far. She has a very neglectful husband and in small villages people talk, but she just wants to have a bit of fun." Adds Abigail: "She dresses a bit below her years, with quite a feminine and girly feel and lots of bright colours and floaty dresses. I loved playing her." The role turned out to be a poignant experience for Abigail, the daughter of the late John Thaw. "There were a lot of people on Midsomer Murders who had worked with my father. They came up to me and said such lovely things about him. One of the drivers even made me cry because he was so kind. I feel privileged to meet people - both cast and crew - who have had a part in my father's career."